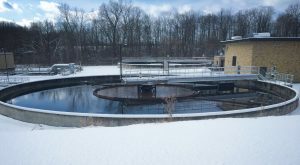 Approximately 55% of Cayuga County households discharge their wastewater into a municipally owned wastewater treatment plant (WWTP). These plants are required to remove a certain amount of pollutants before the wastewater is discharged into a receiving body of water such as a stream. Some wastewater treatment plants are able to remove more nitrogen and phosphorus from their discharges than others depending on their equipment and how they treat wastewater. Operation of these WWTPs is regulated by the New York State Department of Environmental Conservation (NYSDEC). The NYSDEC issues permits to WWTPs that specify how much pollutants must be removed before the wastewater is discharged. Improperly operated WWTPs can become a source of nitrogen and phosphorus pollution. In Cayuga County, there are six municipally owned WWTPs. In addition, there is one WWTP located in Tompkins County that discharges into a stream that flows into Cayuga County. Information regarding these systems can be found by clicking on the system above. For further questions regarding WWTPS contact the NYSDEC, Region 7 at 315-246-7500.